Hello again, everyone! I'm happy to say I've returned from my vacation feeling refreshed and very motivated to continue working on RPG in a Box! This past week I focused on getting the new script parser implementation mostly finished up, but (as I mentioned prior to my break) I still have some leftover updates to share from before. 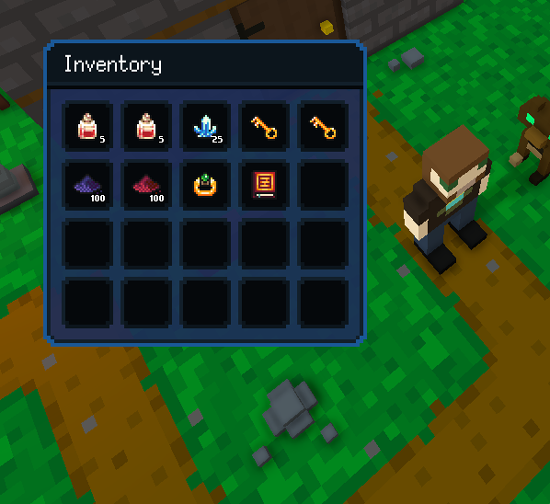 I'd like for v0.5 to support item stacking in the player's inventory and item containers, so I started adding some initial functionality in preparation for this. In its current state, you can specify if an item is stackable (and its stack limit) from the Item Editor. I've also continued to implement and test various scripting functions into the new game engine for v0.5. The GIF below shows a script being triggered to test the "while" loop, "Give Item", and "Wait" functions by giving an item to the player every half second. As another example, the GIF below shows the "Set Group Light Color" function being tested by changing the color of the torches's light sources. This makes use of the grouping functionality available in the Map Editor to group multiple entities together. In the Map Editor, I made a small update so that objects and navigation paths will now automatically adjust up/down when a tile is replaced with another of differing height. Also, the scripting language and visual editor was updated to support local variables! This should make it easier to store and manipulate values that are only needed within the scope of a script. 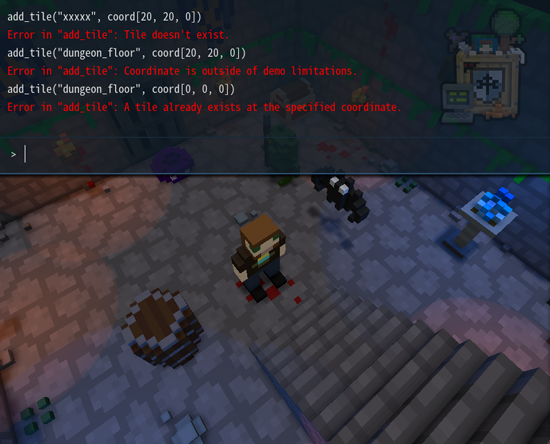 Lastly, I went through and added helpful error messages that will display in the new debug console. For example, if you attempt to use the "Add Tile" function but specify an invalid tile name, an error message will display to indicate this. Thank you so much for reading and for your continued support! Over the coming several months I plan to put a lot of focus on the game engine/gameplay side of things. I'll also be polishing the editors and implementing any remaining functionality still needed for the v0.5 release. Don't forget to check out the Trello board for RPG in a Box to follow my development progress in real-time!